I didn’t get a lot of time to sew this past weekend. 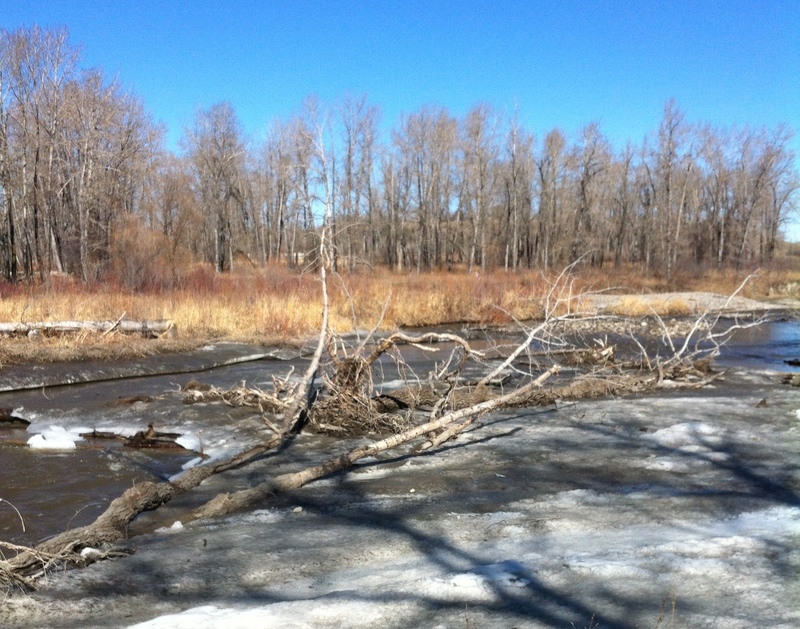 We spent much of the weekend at the creek, checking out the changes winter has wrought (not to mention the changes between Saturday and Sunday!). But I did, in snatches here and there, get started on my (long awaited) Ruby Slip. So, in the end, I went with some 4″ wide stretch lace from this thrift store lace bundle, (this pattern is not recommended for stretch lace, nor for such narrow lace) and for the skirt, decided to sacrifice some of a beautifully-coloured (if not so beautiful-feeling) polyester crepe, snared at a thrift store back home last spring. It’s probably not any good for an actual slip, but, well, it looks nice and has the right drape. Em. 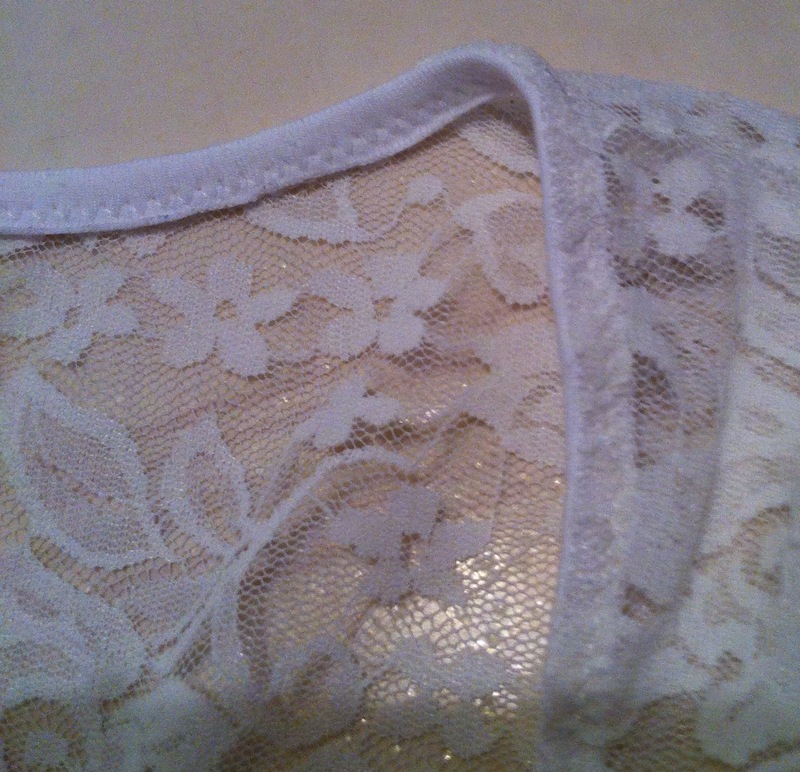 So, this is my first time sewing with lace (other than as a trim), and my first time sewing with crepe, and my first time sewing something cut on the bias. I’ll start with the sewing bits. 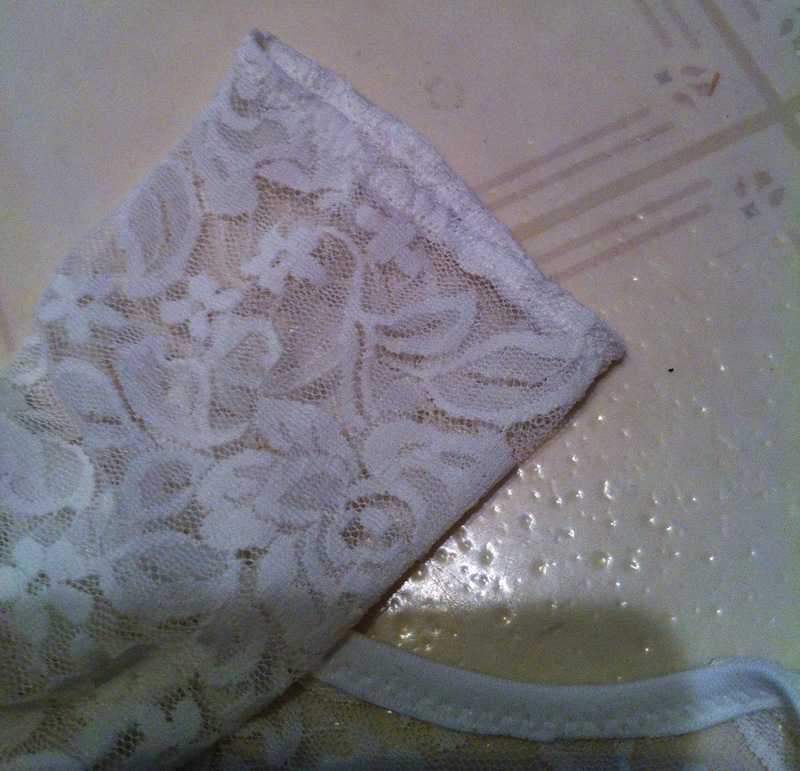 As I mentioned, my lace was a wee bit too narrow. 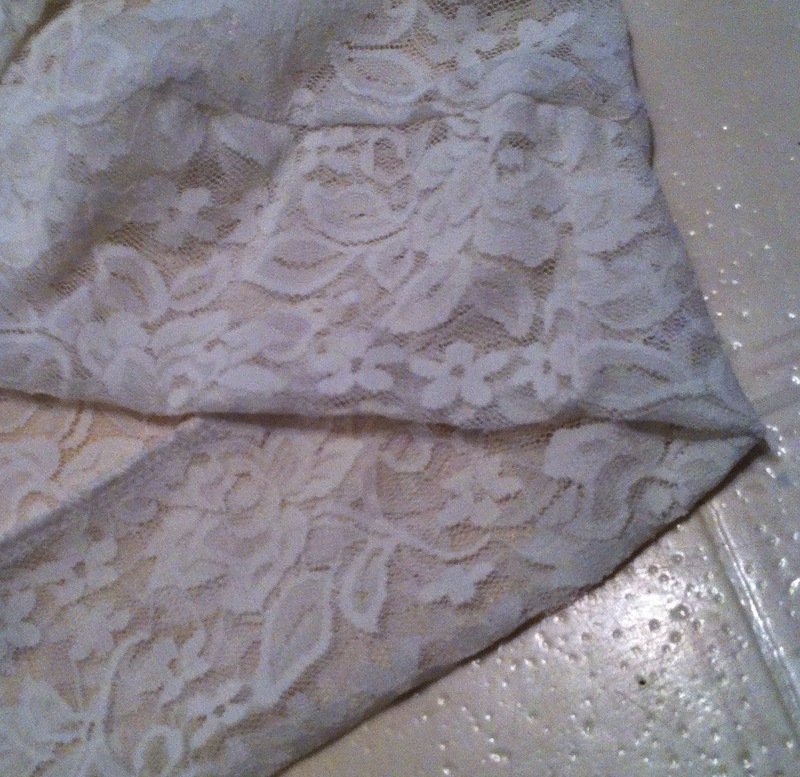 Fortunately, Sherry on the sewalong linked to this post on piecing your lace if it’s just slightly too narrow. Which is what I did. It’s a bit trickier on stretch lace, which wants to, well, stretch out on you, but by backing everything with tissue-paper (my new favourite trick; just like what Steph does in this post) I got it to work quite well, especially on the White. Unfortunately, something went kfzzzt in the foot-pedal halfway through and I had to switch to my modern zig-zag machine, the Janome. Funny, the Janome has better stitches overall, but I really like how the White handles delicate (and stretchy) fabric with its adjustable presser-foot pressure and semi-drop-able feed dogs. As I understand it replacing foot pedals is dead easy, so I’m not panicking quite yet. For a thrift-store gamble that didn’t initially impress me, I’ve actually gotten quite attached to it, so I hope I can resurrect it without too much trouble. I had a hard time matching the notches on the skirt, although it’s hard to say if that has more to do with my sloppy cutting (I am better than I used to be, but that’s a relative improvement and I usually avoid slinky fabrics like the plague 😉 ) or with the weirdness of bias. The side-seams are a bit woobly, mostly where I narrowed the seams (at the top) and then tapered back to the original seam. Random Creek Shot, for interest. The appropriate thing to do, of course, would be to unpick it all, and slice off and re-shape the top as I did for this dress last summer. (I’m not too fussy about the length.) 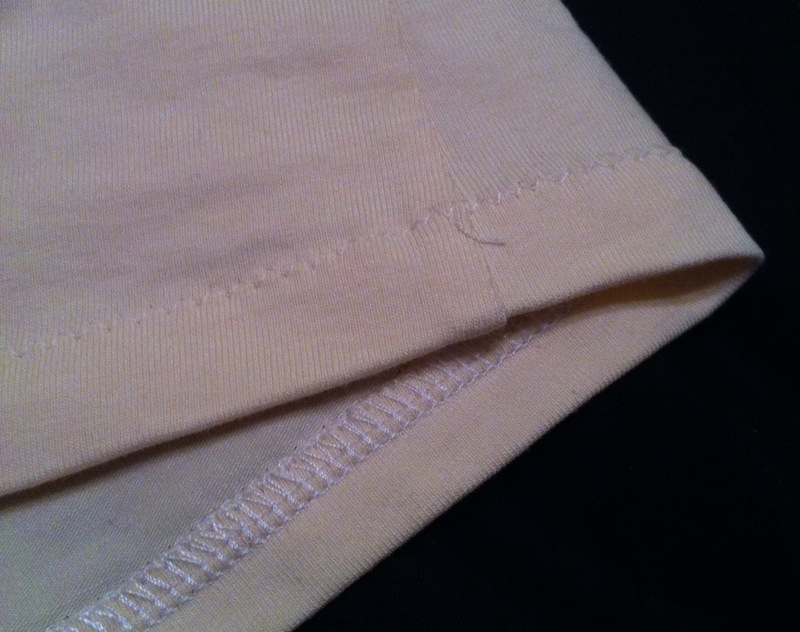 I’m not sure if I have the oomph, though as the seams are already serged and topstitched. We’ll see where my mojo is at in a day or two, because I am really not liking the back view. I’m glad I took the modeled photos, though (even if they required photoshop de-niplifying) because it really brings home the back-tightness issue. And now I can see that the front of the skirt is definitely hanging lower than the back, something that wasn’t obvious when it was hanging on my dressform. Yes, the dubious duct-tape double got some use, although again, her usefulness appears to have been limited. I think in this case because the direction she hangs naturally isn’t quite the direction I stand in. I think the width in the front is fine, it’s just the back which is too narrow. Anyway, that was a lot more than I was expecting to write about something that’s not even finished yet (and really requires some re-working). At least the bodice (which I had sort of thought would be the worrisome bit) is pretty much perfect. 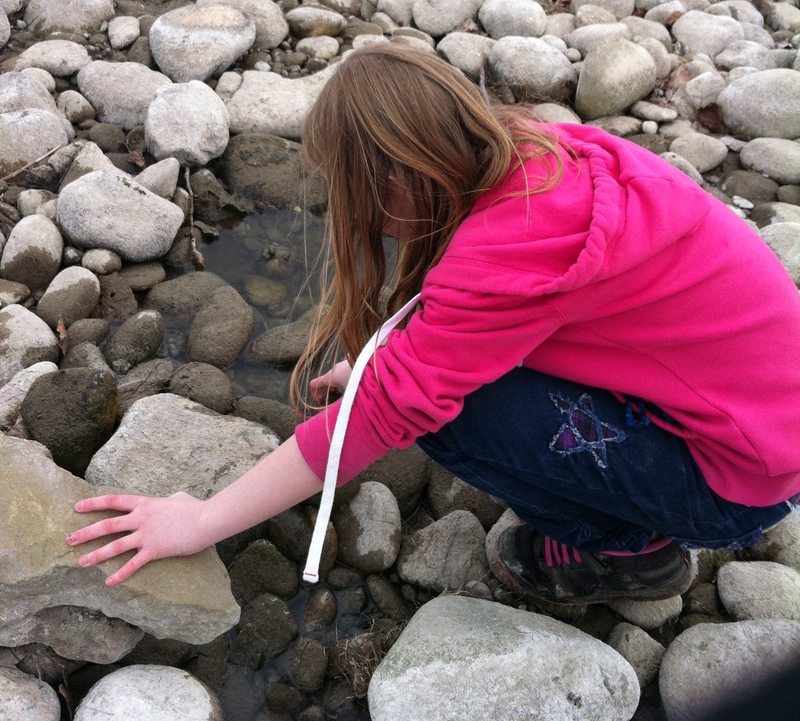 And, just because she’s wearing jeans I made her, I’ll leave you with a picture of Tyo re-arranging rocks at the creek. *Disclaimer: there is, in fact, a very high-end bridal fabrics store in town, which I have not scoped out. I have no doubt they have all the lace and silks I could possibly want. However, they are a) located downtown, where I never go, and b) would no doubt break the bank, so would probably not be the best choice for a first trial of the pattern anyway. I do truly, truly love how quick knits can be to sew up (especially when I’m floundering for a blog post 😉 ). I made up the pattern for this after supper last night and had the entire thing cut out and stitched up before bedtime. Yay! Last week when I asked about ideas for my lace, there were lots and lots of very good thoughts, including another one of my 70s maxi-dresses (which would’ve been divine) or a top-and-skirt combo (and some links to some really neat skirts, too…) but the t-shirt dress, a la Carolyn, seemed to win out overall, and, most importantly, to me. For the sleeve, I eyeballed a “nice, just above-elbow” length, which turned out to be about 18cm below the armpit. 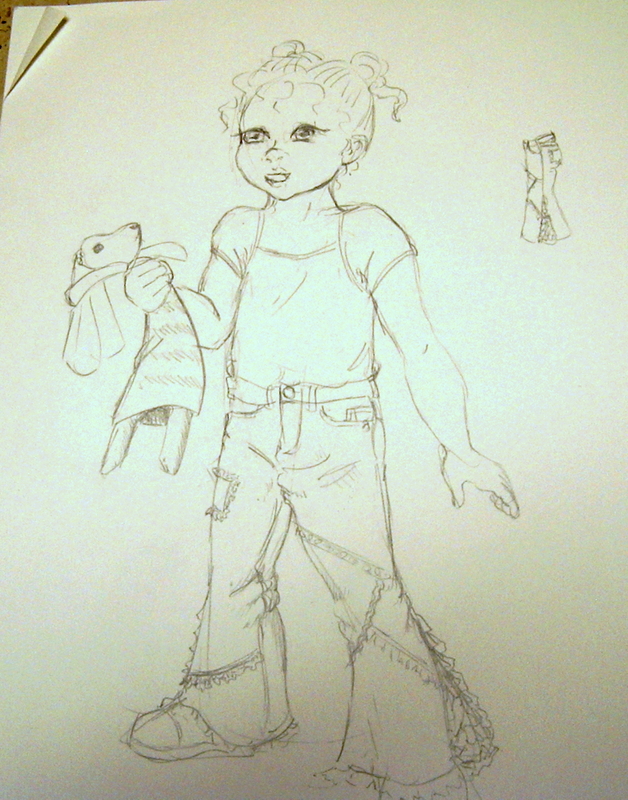 I added quarter-inch seam allowances, and proceeded to (ulp!) cut my fabric. I think it’s worth mentioning a couple of things about the fabric. 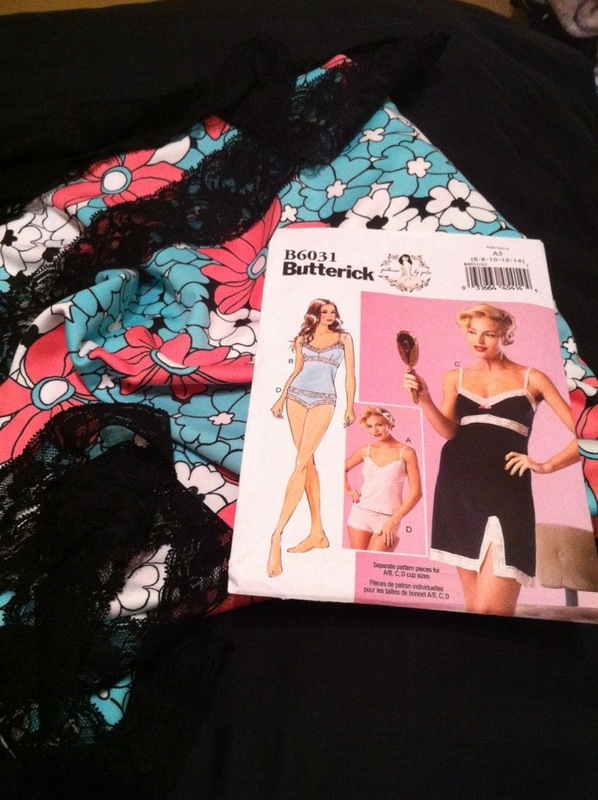 You all met the lace, a gorgeous bargain-bin find, last week, of course. What I didn’t mention is that one of the reasons I hadn’t done anything with it yet (other than the weather) was that I didn’t have the right underlay. So last week, aside from juggling children, schoolwork, and ER visits (no lasting harm done), one of my goals was to acquire said fabric. It had to be smooth, stretchy, not to heavy, and set of my lace. Syo and I wandered high and low through Fabricland draping my lace over every solid-coloured knit. We started in the bargain centre, but of course what I settled on in the end was a much pricier cotton-lycra blend, setting me back roughly $10/m. Not humongously expensive (especially compared to the bamboo knits or some of the other nice athletic solids), but considering this is going underneath a $2.50/m fabric… yeah. Well. Anyway, I bit the bullet, and I have to say I love the fabric—its feel, stretch, recovery—more than enough to pay that much again. 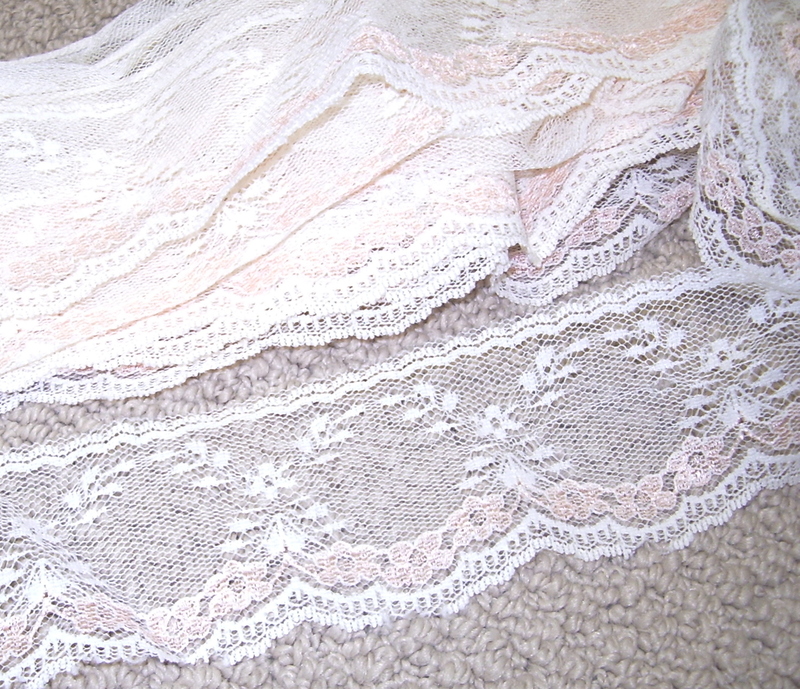 After much hemming and hawing, I picked a bright white, too, rather than an ivory or cream colour—I like how it brightens the overlying lace. So, I had both my fabrics. 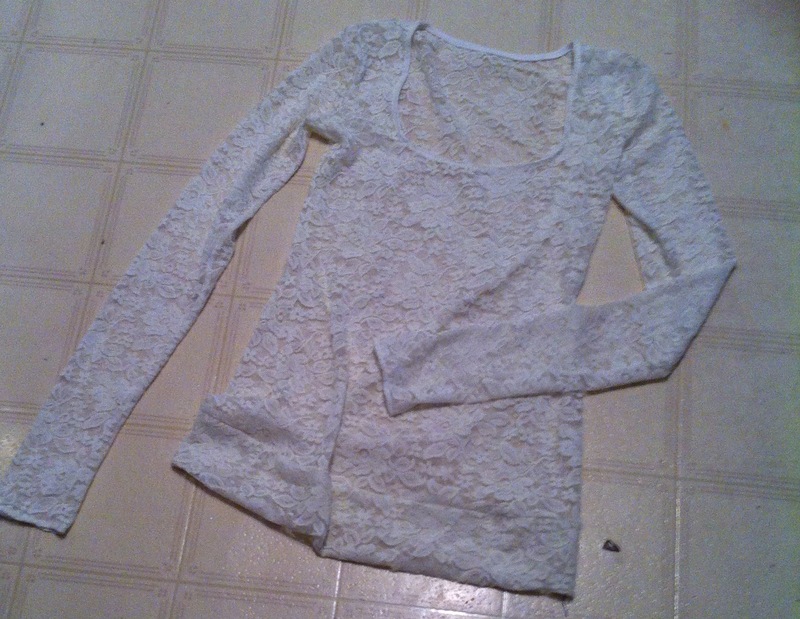 I cut the bodice front and back out of both, but the sleeves only out of the lace. Now, stretch is always the wildcard when it comes to knits. Depending on the fabric, my knit sloper can produce garments that are either tent-like or alarmingly form-fitting. I wanted the lace dress to be form-skimming rather than sausage-skin-like, so I had checked its stretch, in a very rough and ready way, by marking a length of the fabric equivalent to the bodice front across the bust and then stretching this on me to see how snug it was. 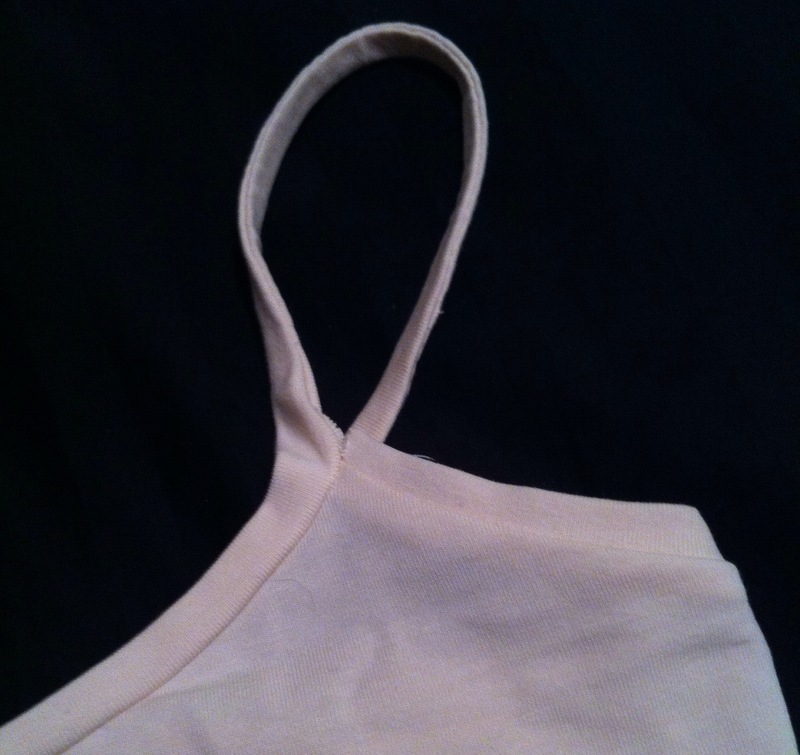 If it was too tight I was planning to add a bit of extra ease to the bodice, but it seemed all right—yay! I did not perform said test with the underlay, choosing to hope that it would be, at least, no more droopy, and hopefully just a bit more snug. 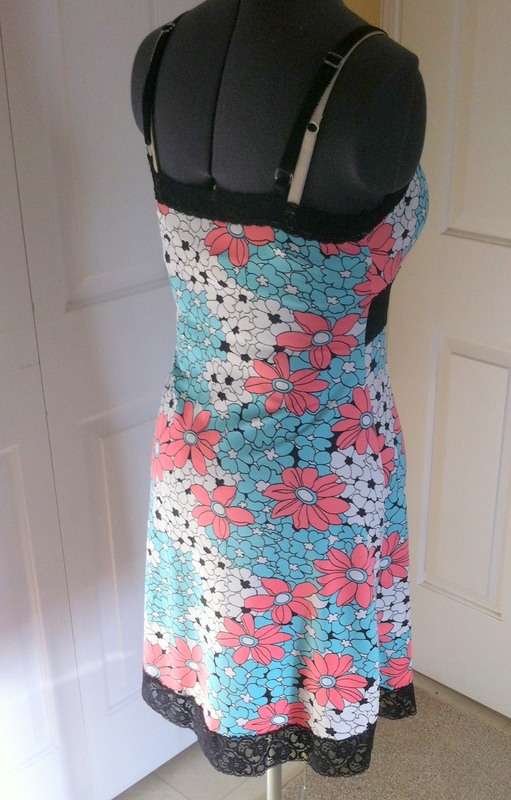 For once, the sewing gods were not vengeful, and that seems to have been the case. In another interesting observation of knit/stretch, I meant to trim the underlay shorter (since you wouldn’t want it hanging out from beneath the scalloped edge) but totally forgot. 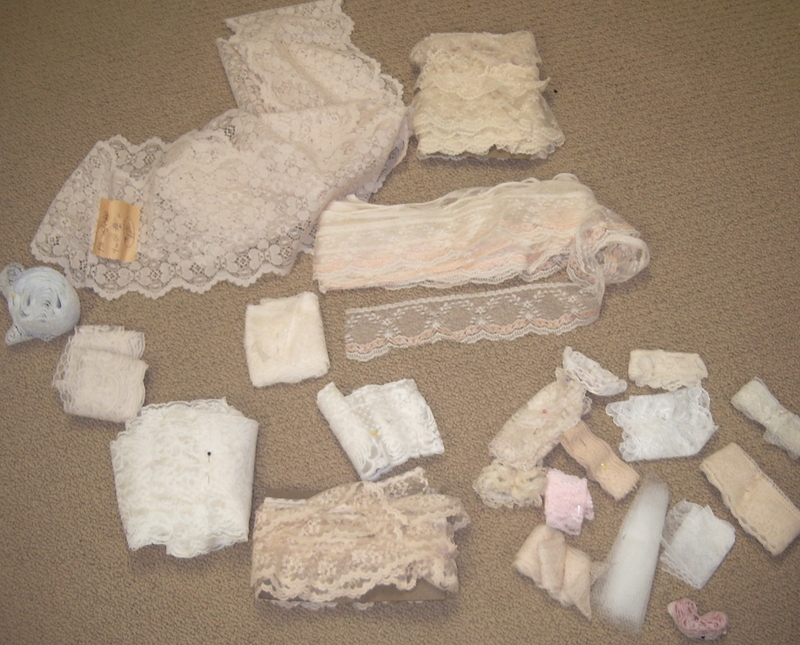 Once assembled, however, the lace naturally stretched to an inch or more below the underlay bottom edge—perfect! Construction wise, I pondered a bit. I knew I wanted it attached at neckline, shoulders, and arms, but I figured I wanted the side-seams of the dress to move separately. This took a bit of mental gymnastics, and some fudging, as I basically followed my usual construction order (one shoulder, bind neckline, other shoulder, set sleeves flat, sew underarm and side-seams in one pass, except it was two passes this time. ), but mostly has worked out. Now, in fairness, all is not perfect. There are any number of oddly-pulled areas, around the hem, side-seams, and shoulders; my neckline didn’t come out perfectly symmetrical (boo! 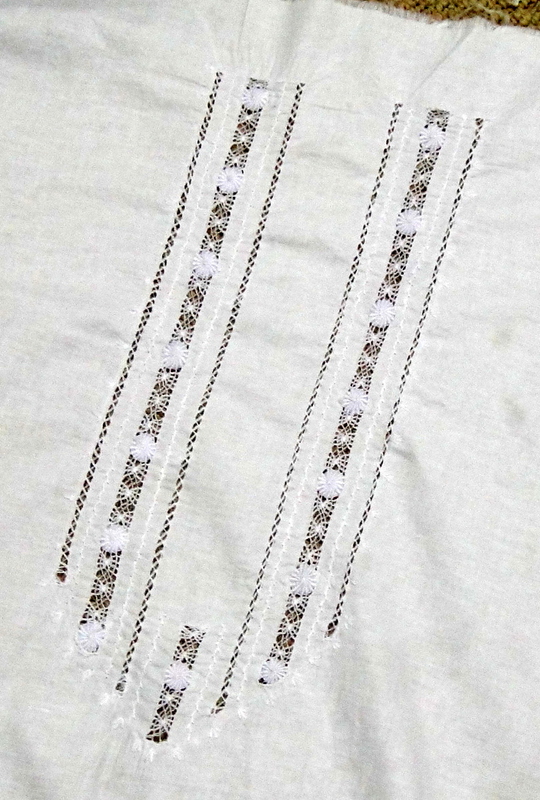 ), the lace tends to droop in one spot, which I can relate directly to the ends of the fabric piece being more stretched out than the middle when I was cutting. For the most part I’m not going to sweat them until I wash the whole thing at least once. 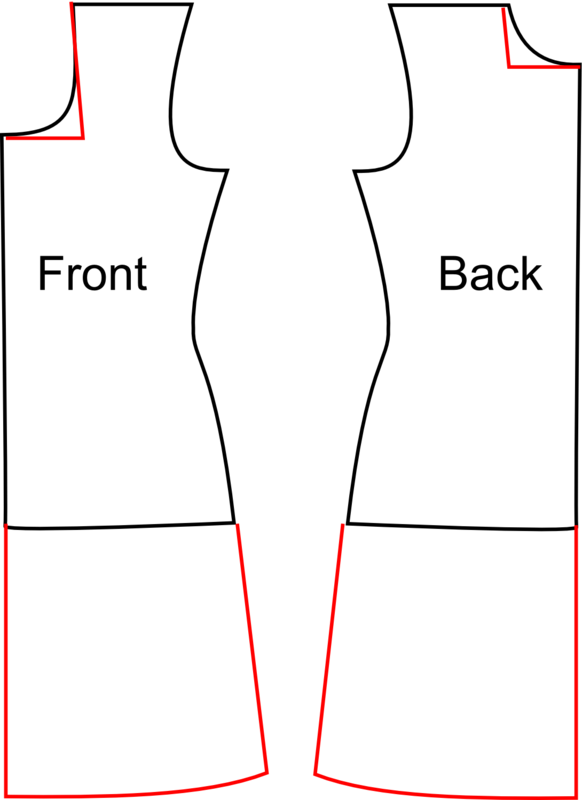 I was at a loss as to how to properly bind a square neckline in a knit (google mostly pulled up stuff featuring woven bias binding, not at all what I was looking for), and the V-neck methods I was hitting on all seemed to have a much wider band than I wanted. 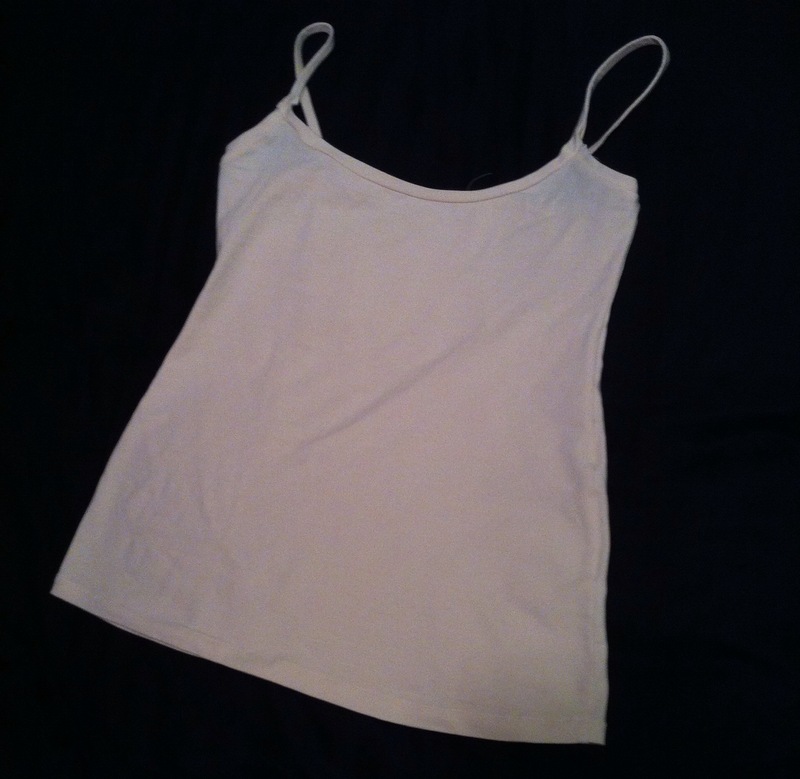 I did toy with trying to use the scalloped edge on the neckline, but the scallop seemed a little big and floppy. So in the end I just bound it with a strip of the lace and a bit of clear elastic. As I’ve been doing with my more floppy knits lately, it seemed easier to just turn the entire band to the inside and topstitch… In the end this worked all right, although the corners aren’t crisply square any more. Meh. 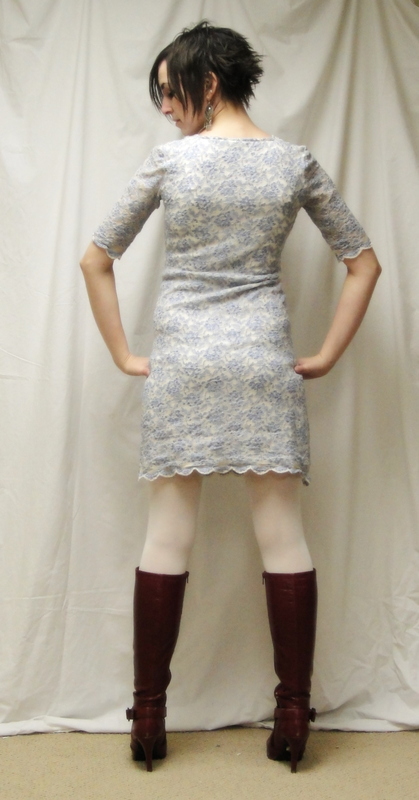 I was hoping to skip out on hemming the lining fabric, but it’s one of those knits that rolls like crazy so I will probably have to :P.
On the whole, I’m not bothered, though, because I have a great lace T-shirt dress! 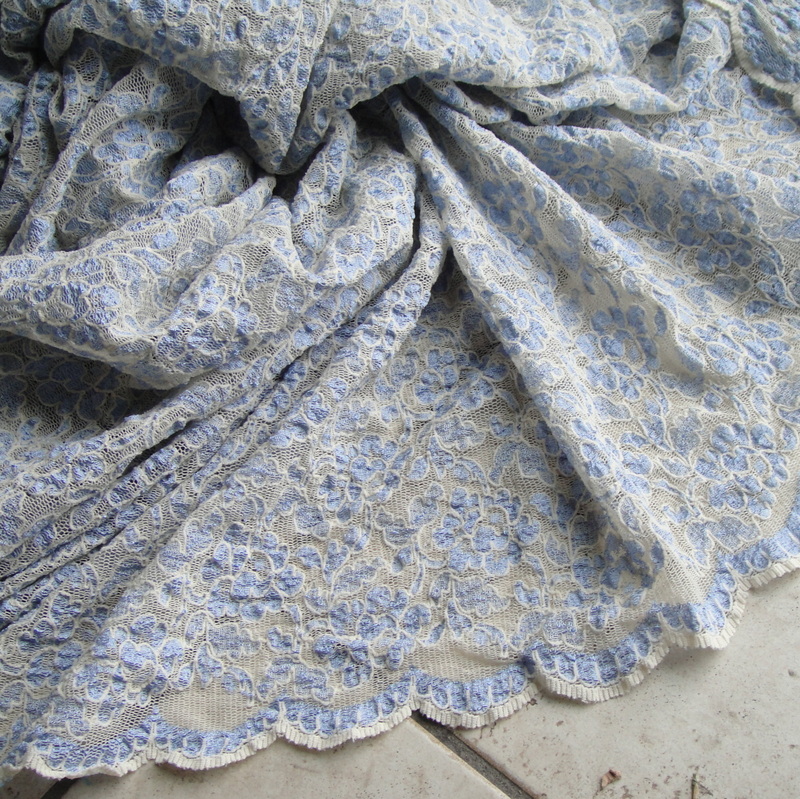 And, even better, I still have over a metre of my lace fabric left… what to do, people, what to do? 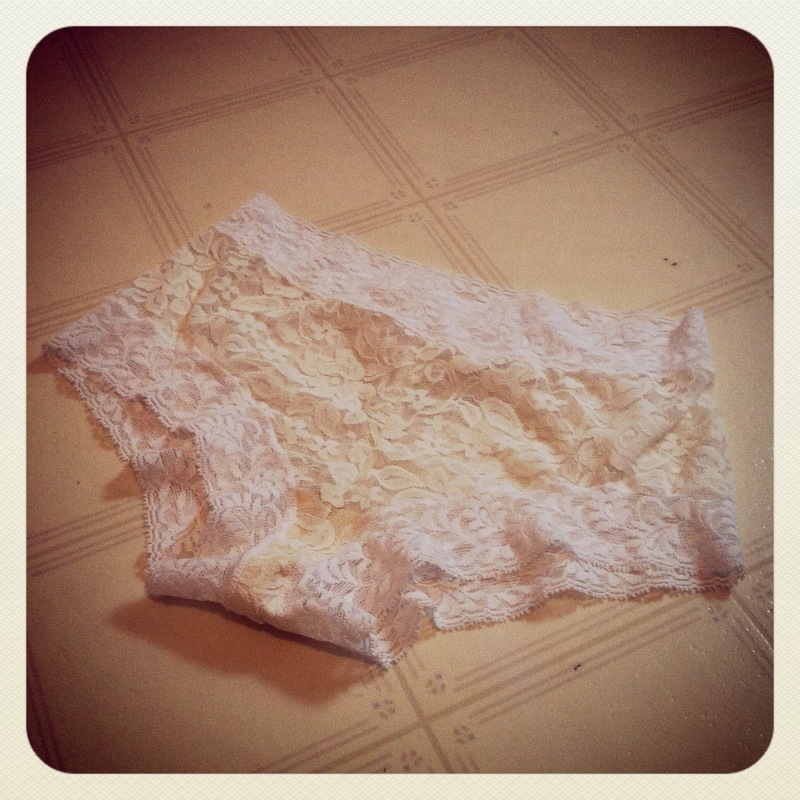 A while back, I posted a teaser comment on Carolyn’s blog saying I had a question for her about lace. And then I got distracted. 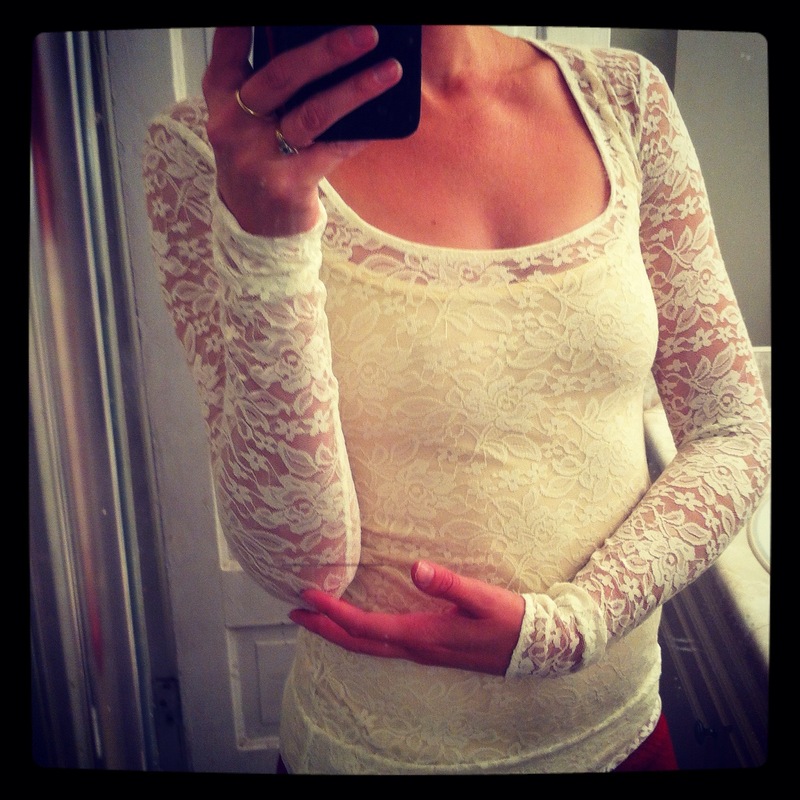 But finally, here it is, and I’d love to hear opinions from all of you—I singled Carolyn out merely because, as we all know, she’s the queen of using lace without it looking frilly or juvenile. I have a bit of a love-hate relationship with lace. I am not (certain evidence to the contrary) the frilliest person in the world. And while I like the idea of lace (I am, after all, a sucker for texture and lace is pretty much texture distilled), I often am underwhelmed by the actual trims and fabrics available. That being said, when I found this 4-way stretch (or is it 2-way stretch? Can someone with an industry background school me in the correct usage?) 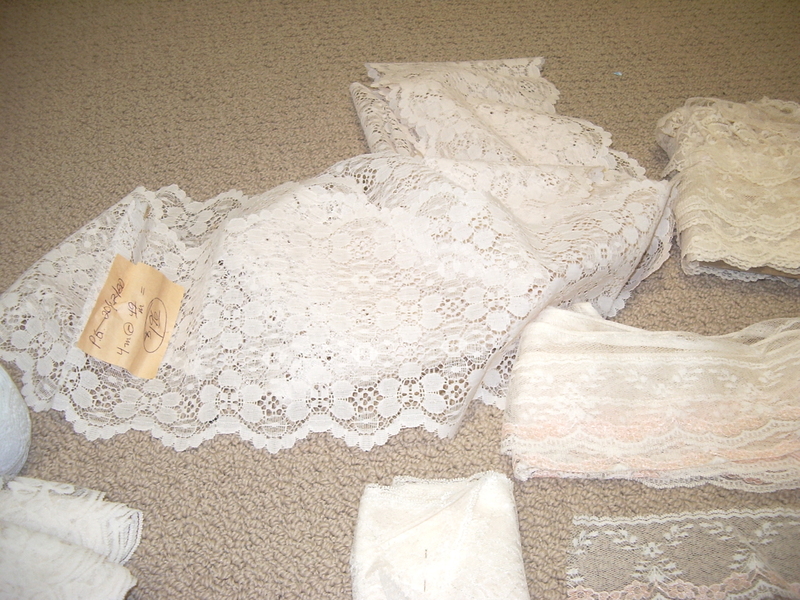 lace in the bargain bin at the Fabricland in my hometown at new years, I had to snaffle it up. (I think it was $1.50/m). The colours are perfect, it’s got the depth of texture I love—I love everything about it. I scooped up everything that was left on the bolt, just under 3m, although it’s only about 90cm (41″) wide. And now that spring is edging around the corner (it’s supposed to actually rain! ), I’m itching to use it. I just don’t know for what. It’s got that great scalloped edge along both sides, which clamours to be worked into the hem of a skirt, but I don’t do dirndls particularly well. I’ve thought of a form-skimming t-shirt dress, sort of like this one Carolyn made her daughter. But is this really the best use of the lovely drape this has? Help me out, people! What would you do with this? UPDATE: WTF, it’s snowing again?! ?